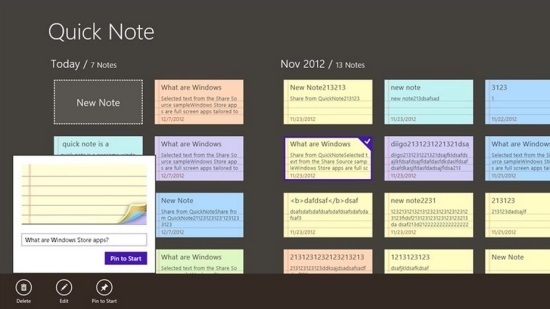 Here is a list of 3 free Windows 8 Note Taking apps. Using a Note Taking app is probably the most efficient way to keep your notes organized. If you have a habit of taking notes while reading something on your Windows 8 PC or doing any other stuff, these note taking apps would be worth a look. While some of them allows you to pen down your thoughts in a simple way, others offer sync facility to make your notes available and accessible across various devices. Apart from taking notes, they also offer advanced features like sharing, pinning, customizing, etc., and make your Note Taking experience a fun activity on your Windows 8 PC. So let’s have a look on these free Windows 8 Note taking apps one by one. 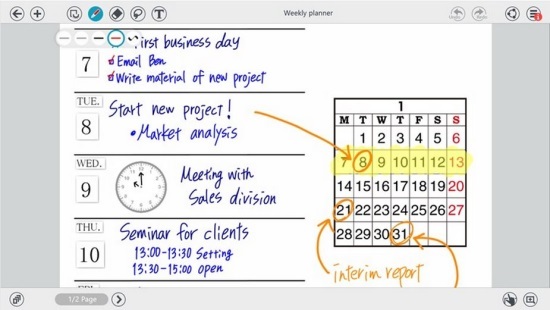 Quick Note is a simple and easy to use Windows 8 note taking app. It can be used either as a simple note taking app or a to-do lists app. Quick Note comes with a user-friendly interface where you can add as many notes as you want. The notes can have colorful backgrounds and can be organized according to date and time. While writing notes, the app also offers spell-check support to help you prevent doing spelling mistakes. The app nicely organize all your notes as tiles on the main screen, and also allows pinning selected notes on the Start Screen as reminder. Plus that, if you are using Internet Explorer, you can add any selected text from the web as a note to this free Windows 8 Note Taking app. Quick Note can be availed freely from the Productivity category of Windows Store, or using the link given below. Click here to get Quick Note App. Note Anytime Lite is an amazing Windows 8 Note Taking app that lets you create notes, annotate PDFs, draw sketches, and do lot more. The app is cross-platform compatible and allows sync, cloud backup, and sharing between various social networks. There’s a wide range of pens, layouts, and graphics available to take notes, and a limitless white space to accommodate everything you need. It also provides multi-language support and a zooming feature of up to 50X scaling. You can read more about this wonderful app in our full review (link given below). Note Anytime is an award-winning app and a must try for everyone looking for a simple yet powerful note taking app. The app can be availed freely from the Productivity category of Windows Store, or using the link given below. Click here to get Note Anytime Lite. 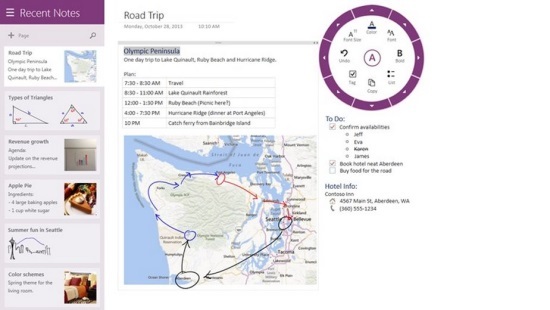 OneNote is another free Windows 8 Note Taking app that allows you to take notes on your Windows 8 device easily. This is an official Microsoft app with a Metro-Style interface. OneNote has everything a good note taking app is supposed to have; it lets you easily jot down important points, to-dos, add web clips, and draw sketches. The app automatically saves your notes and sync them on its own cloud, so that you can easily access them on any of your devices whenever you want. Notes can be organized in notebooks, sections, and pages, and can be shared with friends and colleagues. Other interesting features includes quick search, scanning whiteboards and documents, and importing web pages. Read more in its full review or get it free from the Productivity category of Windows Store or using the link given at the end. Click here to get OneNote. These were some of the best free Note Taking apps we have reviwed. Though there are plenty of others available as well, these are quite handy and loaded with unique features. So go get them now and see which one suits you most. Don’t forget to share your experiences with us. We love to hear from you via comments.